Root weevil damage distracts from an otherwise beautiful collection of shade loving plants. I wanted to write a blog about shade plants for root weevil resistance. Root weevil disfigure so many shade garden plants and can make a garden look ravaged. It’s disappointing to see hosta and other plant leaves looking all chewed up. 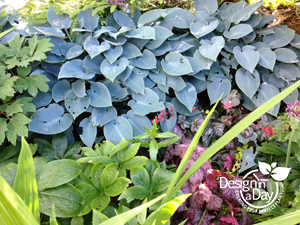 Can we design a shade garden with beauty and style without using root weevil favorite snack plants? “Well HELL that’s not much of a shade garden” is what I said when I thought about eliminating all the plants root weevil like to eat. I was disappointed in the tiny number of plants that would work and wandered off to write about something different, something a bit cheerier!!!! However, I’ve been thinking about it and yes, we have some great plants we can use. Aucuba, Daphne and Fatsia are not root weevil favorites and if you select the variegated forms the notching doesn’t show as much. 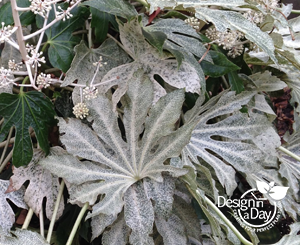 To be specific, Daphne odora ‘Marginata’, Fatsia japonica ‘Spider’s Web’, and Aucuba japonica ‘ Gold Dust’ are varieties that I recommend. I have never seen much leaf damage on our Native Huckleberry (Vaccinium ovatum) probably because the leaves are so tiny. The fuzziness on the bottom of the leaves on some Rhododendrons reduce Root Weevil damage. I’ve found the official lists less than helpful since most Rhododendron listed are sun lovers. Root weevil prefer part shade to shade. Rhododendron ‘Clipiense’ is my best weevil resistant compact rhododendron for shadier situations. This rhody has fine hairs on the leaves so root weevil rarely bother it. It’s a slower growing variety and can take more shade than the other two I have listed but not deep shade. Rhododendron ‘Fred Peste’ is a compact red rhododendron. Fred does well in morning sun and afternoon shade, although he can take more sun than average. 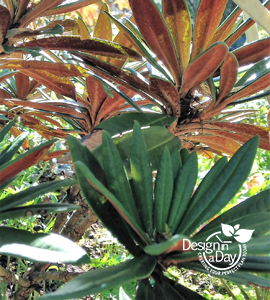 Rhododendron ‘Blue Diamond’ can take full sun but does well in full am sun and afternoon shade. It can get taller than wide. 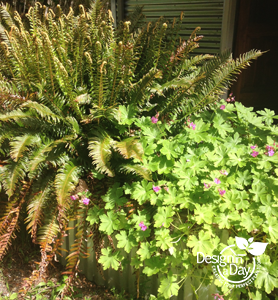 Sword fern (Polystichum munitum) and Hardy Geranium (Geranium macrorrhizum) do not show Root Weevil damage. Sword fern (Polystichum munitum) has a fuzzy frond (leaf) and root weevil don’t eat fuzzy leaves typically. Most fuzzy fronded ferns will be root weevil resistant and are an important player in a root weevil free planting. Hellebores are typically safe from weevil once they are mature plants. When the soft and munchable new leaves unfurl in February the root weevil have not hatched yet (here in Portland) so are not present until late April or May. The harder leafed hellebores like Helleborus argutifolius seem particularly impervious. Last but not least, Euphorbia Rob’s spurge (Euphorbia amygdaloides var. robbiae) is a tough evergreen ground covering shade plant. I consider it a thug but it’s great to use in gardens where I have a path that doubles as barrier to their creeping roots. This plants roots must be contained or it will march right over your hostas. I’ve never seen any root weevil damage on this plant. Root Weevil have no natural predator here in the Pacific Northwest so it’s rare to find a shade garden without them. We can cut the population of root weevil down to tolerable numbers and thus get our beautiful shade garden back. Read my blog “Attack of the Root Weevils” to learn what can be done to reduce their population in your garden. What’s all the fuss about the new Itoh (say it Eeetoe) Peonys? These new plants eliminate the only weak point of the old fashioned peony, the weak stems which can really spoil the flowers in our often wild and wet spring weather. Ok they do cost 3 times as much as the old fashioneds but read on. Why do we want Peonies anyway? They are EASY and will outlive you!! The flower is fabulous, fragrant and since the 1400’s has been filled with historical and cultural significance for us humans. My grandmother (today is her birthday), loved them and picked an armload for the house and to decorate the family graves on Memorial Day. Itohs cost more than the old fashioned so expect $50 to $100 for a medium priced plant. The tissue cultured plants may be cheaper but I don’t recommend them because they are not as strong rooted. This will effect how many flowers you get on your plant year after year and this is a plant where the flower really matters. The dissected foliage is great but hey its about the flower this time. Here is my best source for peony of any kind, herbacaous, tree or Itoh. Rick Rogers is a 2nd generation Peony designer and grower in Silverton Oregon. His father is an international star of the peony world. Rick grows peonies the old fashioned way, propagating new peonies by extracting these perfect bits of root stock. Taking these cuttings is an art form and his plants will outgrow and out flower tissue culture generated plants easily. Rick’s nursery is called Treony……www.treony.com. Email him for his list of Itoh if he doesn’t have them on his web yet. 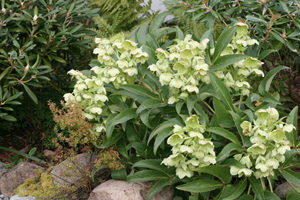 Also see Wayside Gardens catalogue/web site, (with fabulous close up of the flowers). Their plants are a lot smaller however than what Rick offers. These are a lifetime investment. They will outlive you and can be dug when you move but plan to dig very very deep. 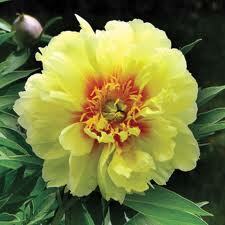 Now regarding NO FEAR gardening, The Itoh Peony can test your ability to postpone gratification. The first year, cut off all flower buds,do not let any of them flower!!!! that takes faith, hence NO FEAR. The second year, let yourself have 1 flower and cut all the rest off while they are still buds. The third year, let them rip uhm……….flower. Those who cannot do this may have to wait ten years to get anything near the number of flowers that you gentle but fierce gardener will have. It rewards those gardeners who can take the long approach to getting their kicks. I think perhaps Dulcy Mahar would have recommended nibbling on some good chocolate while you cut off the buds. I can assure you having an Itoh peony with 40 blooms on it will stop you in your tracks so it is worth it. Did I mention the plant has very attractive foliage, is low water and has golden fall color as well?